Friday evening at six pm saw me standing in the little park at the centre of our town and staring up towards the sky. People were probably saying, “look at that eejit,” but that’s nothing new, I reckon. The little park at the centre of my town is called The Mall. It’s quite like a village green on the same style as, say, Twickenham Green (where I also used to live, once upon a time, long long ago). I walk through The Mall on the way home from work most days and that’s what I was doing on Friday at 6.00pm. Collar turned up, laptop case slung nonchalantly over shoulder, feeling the weekend coming on… when I was stopped in my tracks and forced to look upward and take note. This only happens to me twice every year and it usually on The Mall. It's what I tend to call my ‘Noting of the Season’. Because that’s what it was, that’s what had happened. Suddenly and unexpectedly, a bit like that Mole-Rat thing in ‘Groundhog Day’ (all right, yes yes, I know it was a Groundhog) I came out of my hole and saw what season it had suddenly become. And it had suddenly become Spring. I said this only happens to me twice a year and that’s pretty-much true. The other time is Winter. I stand on The Mall and I stop and I note that it is the Depths of Winter. I know why it happens in Winter, because it’s also Christmas Time and that’s about the only time in a year when I stop for a week or ten days and become quite insular. For the rest of the year, I spend my time running around like a March Hare, residing largely in my head along with my own imaginings and stupid worries. The seasons slip by and I hardly notice them at all. But on Christmas Night, when most sane people are comfied-up watching Dr Who or The Downton Abbey Special, I go for a walk and I generally end up on The Mall and I can guarantee that I will be the only soul there and the depth and darkness of Wintertime will strike me in that moment and I will mark it. That’s not a bad thing. I like Wintertime. It’s a time of warmth and protection for we, the lucky ones who have the resources to weather the storms. So, yeah, Autumn and Summer may often sail past me but I take note of Winter. 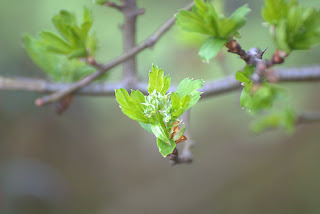 They didn’t have ‘leaves’ per se and many of them still had nothing at all to show, but some of them had buds which has just erupted into compact green bushels. More the ‘promise of leaves’ than actual ‘leaves themselves’. But there they were all the same. Where, this morning, there had been bare boughs now there was an instigation of green. It was a tiny golden/green moment so I stopped to look. Not to sigh poetically (as if) or certainly not to draw attention to myself. Just to Mark the Turn. How many Turns do we get to Mark in our lives? Not too many. When you Mark a Turn, it’s best to stop and imprint it on your retina, sink it down into your mind. And good man yourself, Ferris. Of course in Scotland it’s not uncommon to experience all four seasons in one day so to announce that it’s, say, Spring-according-to-the-calendar is something of a moot point; it’s whatever season the damn weather decides it’s going to be for the next couple of hours. When I was younger there were distinct seasons and the rhyme about April showers and not casting clouts (pron. ‘cloots’) made some sense even if I didn’t know (or much care) what a clout was. Nothing makes sense these days and so I’ve pretty much lost interest although, to be fair, like you there are points in the year when I’ll look up (metaphorically at least) and think: It’s (for example) Spring: when the hell did it get to be Spring? There’s always the sense that I’ve missed out on something important, had my head in a book or something. Not sure who you’re on about when you say, “Good man yourself, Ferris.” Ferris Bueller or that guy who invented that big wheel ‘hingy? They do a turn.